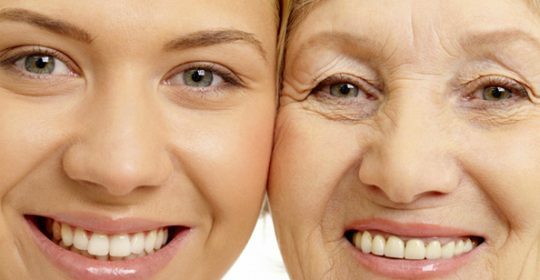 To get skin that defies your age, you have to know what you’re up against. Here’s what’s going on and how to fight back. Cell turnover slow– Through the natural exfoliation process, your skin sheds dead cells as younger ones, generated deep in the epidermis (skin’s top layer), migrate upward to replace them. In young, healthy skin, cells take about 28 days to reach the surface and flake off 12 days later. As you age, renewal slows: New cells aren’t produced as quickly, and old ones hang on longer. Free radicals attack– The body is assaulted by unstable oxygen molecules—called free radicals—from pollution, stress, cigarette smoke, and the skin’s top enemy, the sun. Over many years, this causes cell irregularities, including discoloration and cancer. Collagen breaks down– After age 40, the body typically slows down the rate it produces collagen, a mesh of protein that, together with elastin, helps keep your skin plump and elastic. When collagen degrades and is not replaced at the same rate, the outer skin loses volume and settles into creases and wrinkles.